AFP. Long-standing allies Cuba and Angola have boosted military cooperation during a visit to the communist-run Caribbean island by Angolan defense officials, Cuban state media reported Monday. Cuban Defense Minister Julio Casas Regueiro met with his Angolan counterpart Candido Pereira Dos Santos Van Dunem and "signed an accord recognizing the working parameters to strengthen and grow cooperation between the two armies," the newspaper Granma said, citing an official statement. 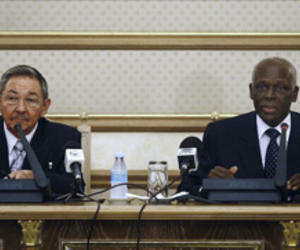 The two men held "warm and friendly" talks in the presence of Cuban President Raul Castro, it added. The Angolan minister arrived Tuesday at the head of a military delegation and has visited Cuban military units and schools. Cuba was a key ally in Angola's fight against colonial power Portugal. Thousands of Cuban troops helped the Popular Movement for the Liberation of Angola (MPLA) fight off rebels following the African country's independence in 1975. Cuban forces in Angola reached 30,000 troops in the 1980s, until they were finally withdrawn at the end of the Cold War as part of a regional pact that saw South Africa grant independence to Namibia. In 2009 Castro traveled twice to Angola, meeting with Angolan President Jose Eduardo dos Santos.